The last several years have seen an upsurge in ethnic and sectarian violence around the world. The rise of ISIS and other extremist groups poses deep security challenges for particular societies and for the global community as a whole. Zainab Hawa Bangura, the United Nations special representative on sexual violence in conflict, addressed the threat that violent extremism poses for human security, with a focus on its gender dimension. Her talk also addressed the critical role of women as peacebuilders in some of the world's most dangerous conflict zones. Bangura was presented with the Georgetown Institute for Women, Peace and Security's 2016 Hillary Rodham Clinton Award for Advancing Women in Peace and Security. She was joined in conversation by the New York Times' Alissa Rubin, recipient of the Institute's 2016 Global Trailblazer Award. 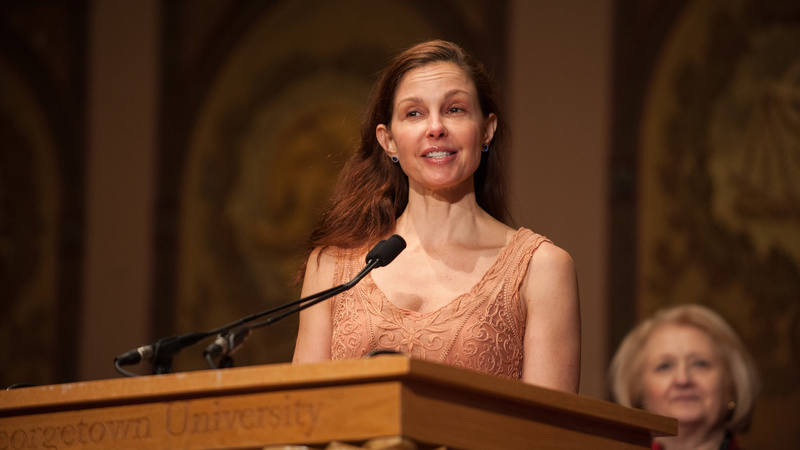 Ashley Judd, actress and political activist, provided closing remarks. 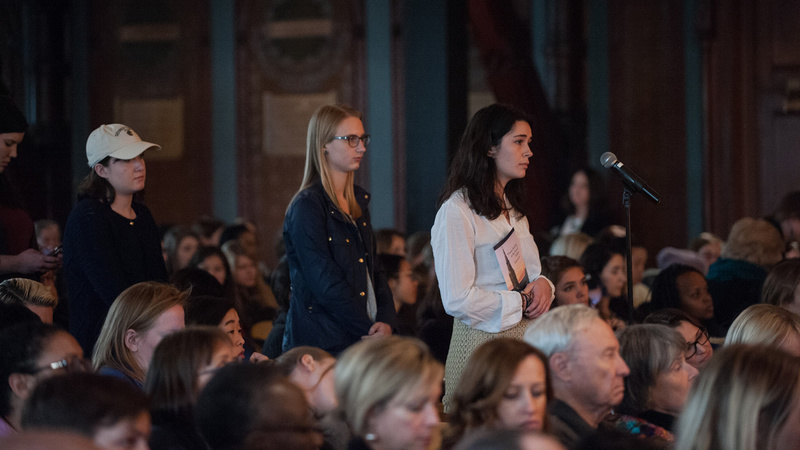 This event was co-sponsored the Office of the President of Georgetown University; the Georgetown Institute for Women, Peace, and Security; the Georgetown Global Futures Initiative; and the Berkley Center for Religion, Peace, and World Affairs. 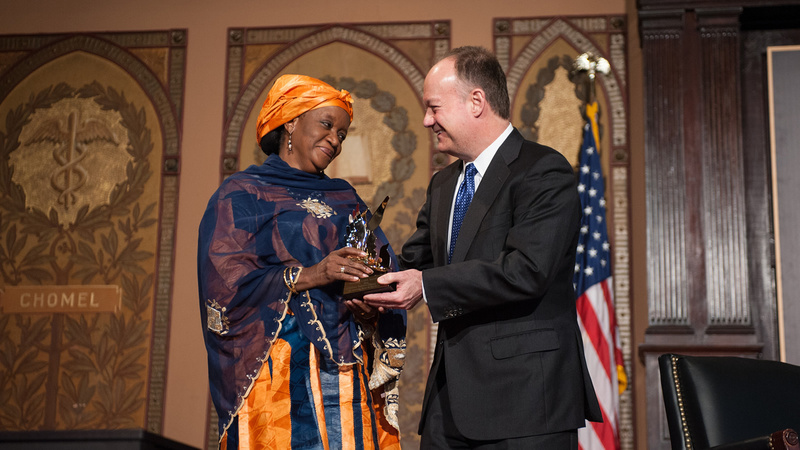 John J. DeGioia presents Bangura with the 2016 Hillary Rodham Clinton Award for Advancing Women in Peace and Security. 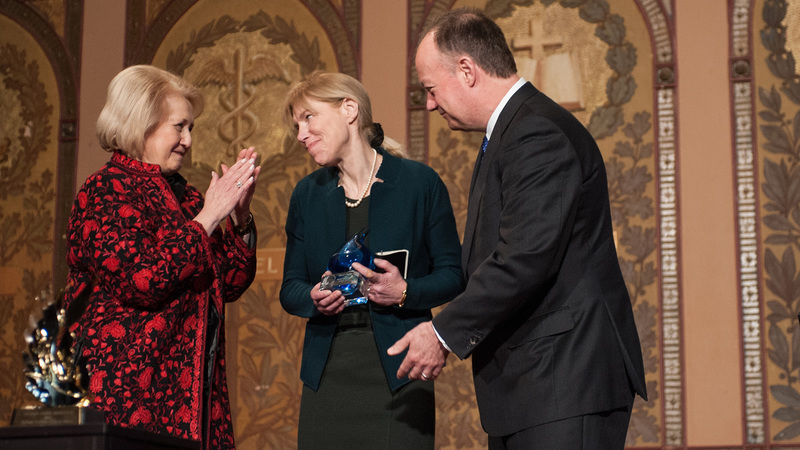 John J. DeGioia and Melanne Verveer present Alissa Rubin with the 2016 Global Trailblazer Award. 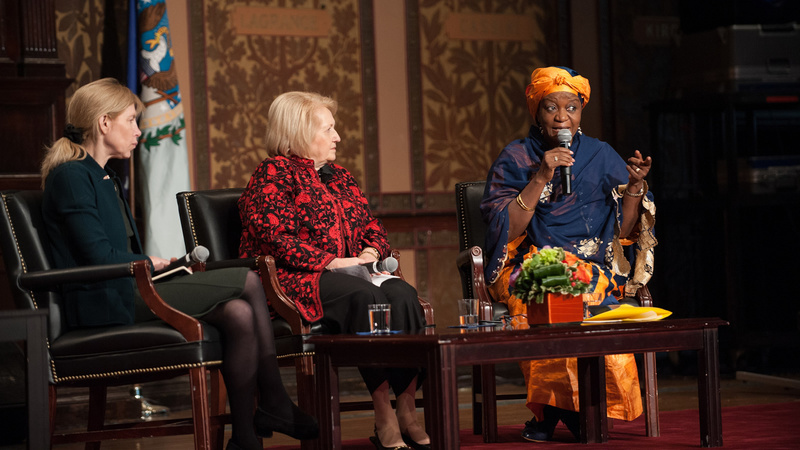 Zainab Hawa Bangura speaks as part of a panel discussion with Alissa Rubin and Melanne Verveer. Ashley Judd provides closing remarks. 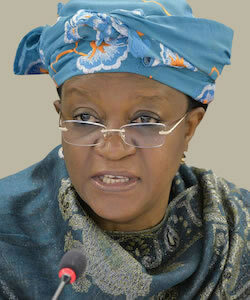 Zainab Hawa Bangura has served as United Nations Secretary-General Ban Ki-moon’s special representative on sexual violence in conflict at the level of under-secretary-general since 2012. Prior to this, Bangura was the minister of health and sanitation for the government of Sierra Leone and previously served as the minister of foreign affairs and international cooperation, including chief advisor and spokesperson of the president on international issues. Bangura has worked to develop national programs on affordable health, advocated for the elimination of genital mutilation, managed the country’s Peace Building Commission, and improved relations with the international community. Bangura is a former fellow of the Chartered Insurance Institute of London, possessing diplomas in Insurance Management from the City University Business School of London and Nottingham University. Bangura received her bachelor’s degree from the Fourah Bay College at the University of Sierra Leone. 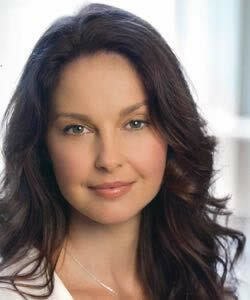 Ashley Judd is an American actress and political activist. Her humanitarian efforts include board of directors service with Population Services International, Defenders of Wildlife, and Shaker Village. She has traveled globally to support grassroots programs addressing poverty alleviation, public health, human rights, and social justice, sharing these groups’ messages of empowerment and equality with heads of state, donors, the private sector, and the media. She has testified before the U.S. Senate Foreign Relations Committee, provided statements to the National Press Club, and in 2008 delivered the keynote address to the General Assembly of the United Nations. She has served as a panelist and moderator with the Clinton Global Initiative, Women Deliver Conference, International AIDS conference, and the Global Coalition on HIV/AIDS, Tuberculosis, and Malaria. Judd received her undergraduate degree from the University of Kentucky, where she majored in French and minored in anthropology, art history, theater, and women’s studies; she has an MPA from Harvard's Kennedy School of Government. Alissa J. Rubin is the Paris bureau chief for the New York Times and has spent much of her career covering conflict zones, including Iraq, Afghanistan, and the Balkans. Rubin has worked to cover war through human stories, particularly through the stories of women; Rubin's reports on besieged Yazidis, female Iraqi insurgents, and Afghan women struggling to gain their rights have focused on these issues. 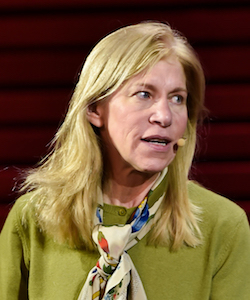 Prior to becoming Paris bureau chief, Rubin served as the New York Times bureau chief in Afghanistan and Baghdad, and she previously worked as a foreign correspondent for the Los Angeles Times, where she served as Baghdad bureau co-chief, Vienna bureau chief, and Paris bureau chief. Rubin received her undergraduate degree from Brown University and a master’s degree in History, with a concentration on modern Europe, from Columbia University.